3M Co., the maker of Scotch Tape and Post-it Notes, wrapped its Maplewood headquarters tower in 12 stories of colorful adhesive film and a message this month to inspire creativity and showcase its design prowess. "Curiosity is just the beginning," is the written message on the building that is newly visible to all passing by. 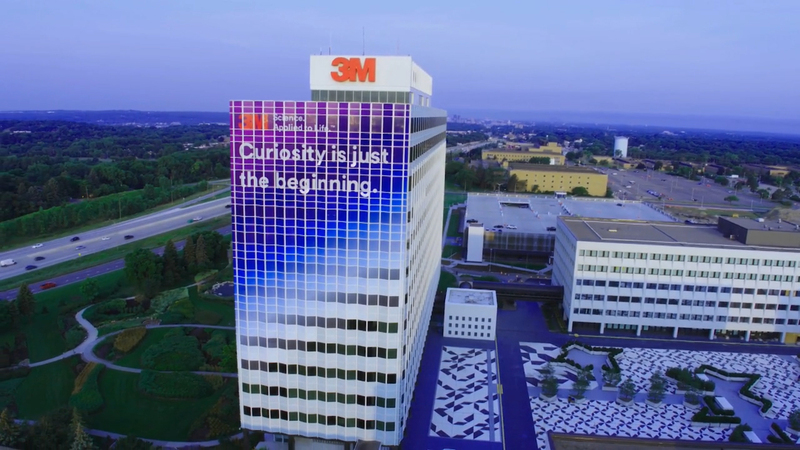 Officials said the effort is part of 3M's "wonder campaign" and is meant "to encourage people to pursue their own sense of curiosity that can lead to discovery and problem solving." The dramatic building wrap can be seen by drivers on Interstate 94. It covers 30 percent of two sides of the main headquarters building. To achieve the iridescent look and design message, 3M partnered with The Vomela Companies specialty graphics firm and used two types of 3M commercial graphics films to achieve the desired effect. The installation was completed Aug. 16 and required 500 pieces of film on each side of the building that fit together like a mosaic. 3M's opaque "Controltac" graphic film was used for surfaces without windows. Its perforated "Scotchcal" window graphic film was used to cover 12 stories of building windows. 3M's optical films have been used for years to wrap buses and trains and cars in the United States. They have also been used to cover buildings before in places such as Japan and the United States.